Claire Corbett’s debut novel, the fantasy/crime genre mash up When We Have Wings was shortlisted for both the Ned Kelly Award for best first novel and the Barbara Jefferis Award given for the depiction of women in Australian fiction. Her new novel, Watch Over Me is far from When We Have Wings, but is also concerned with the plight of women, in particular during wartime. Set in a contemporary but slightly alternate world, it explores the impacts of war and occupation on both the conquerors and the conquered. Nineteen year-old Sylvie’s hometown, the northern European city of Port Angelsund, has been occupied by a force known as the Garrison. Garrison have come to secure a rich energy source off the coast and the rest of the world looked on as the city was occupied. Now Sylvie lives in a world of checkpoints, drones, violence and constant surveillance while the population waits for possible salvation from the equally violent Coalition. When Sylvie is rescued from an abusive situation by a Garrison special forces officer a connection is made that eventually sees her in his arms. Sylvie ends up caught between protecting her mother and younger brother, her revolutionary older brother and her Garrison lover. Her deepening relationship with Garrison officer Will is itself a meditation on the way the town has been taken by its invaders as the lines between invader and captive become blurred. Corbett’s narrative stays in the grey, providing no easy answers either for Sylvie or for the reader. 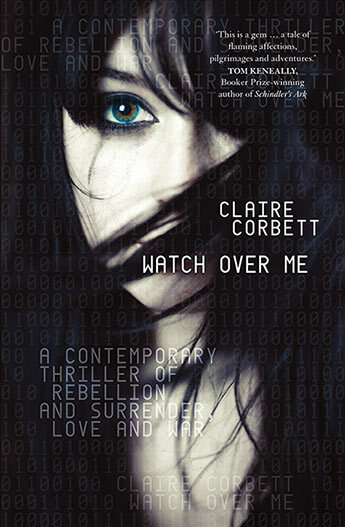 While some of the action of Watch Over Me has a 1984-feel, it is only speculative in the broadest sense. Corbett draws on her extensive knowledge of military matters so that the technology used is all contemporary. The occupation itself is based not only on any number of recent conflicts but Corbett also draws heavily on connections to Greek mythology. Watch Over Me is overall an engaging and effective story based on truths that are unfortunately far from new about communities under occupation and the role and status of women during war time.